FOX Business host Stuart Varney and Herman Cain were celebrating Trump for telling the United States military to shoot any migrant that throws a rock their way. Trump said, "They want to throw rocks at our military, our military fights back. We're going to consider it -- I told them, consider it a rifle. When they throw rocks like they did at the Mexico military and police, I say, consider it a rifle. 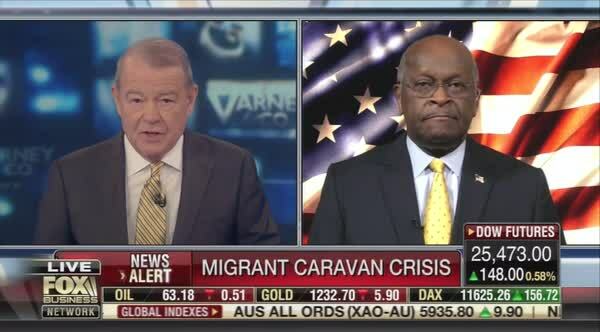 Herman Cain joined Varney & Co., early this morning to discuss the border situation that Trump has used to try and scare voters into thinking America is being invaded by a foreign military force. Before playing video of Trump's remarks, Varney said Trump was "getting tough on immigration." Instead of describing Trump's words as murder, Varney said, "Immigration is now front and center, arguably the other big issue in the election along with the economy. Front and center, tough line Trump. What do you make of it?" Cain said, "I think the tough talk and the tough line is appropriate. We can't allow, as the president has said many times, we can't allow people to just come into this country. It's more like an invasion." Using the term invasion is despicable, as they all know. He continued, "They know, meaning the people behind these caravans, they know that if we get permissive and they're able to come into this country illegally, they want to overrun our system, they want to overrun our laws. I think that the president's stand is the correct stand to make and they ought to heed his warning. He keeps warning them do not come." With no proof, he's trying to blame George Soros for orchestrating the migrants coming from Honduras, seeking LEGAL asylum. There is nothing illegal about what they are doing. "I fear Stuart, somebody is going to get hurt. And it's not going to be because the American patrol or the Border Patrol or the American -- they are not going to start it, but they very well might end it," Cain said. It takes real manhood to say the US military, with military grade weapons, would kill migrants full of women and children if someone threw a rock. As the days go on under the Trump administration, these snowflakes become more cowardly and desperate by the second. Imagine, getting one's rocks off, so to speak, by the imagery of the best military in the world picking off and murdering an imaginary enemy conjured up to get out Republican votes.